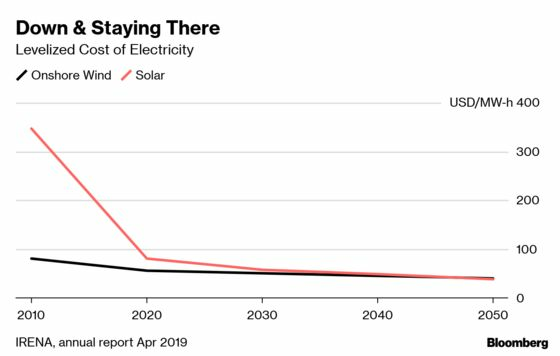 (Bloomberg) -- The cost of reaching global climate goals is falling rapidly as wind and solar prices plummet and policy makers push electrification as the main tool to cut pollution, the International Renewable Energy Agency said. 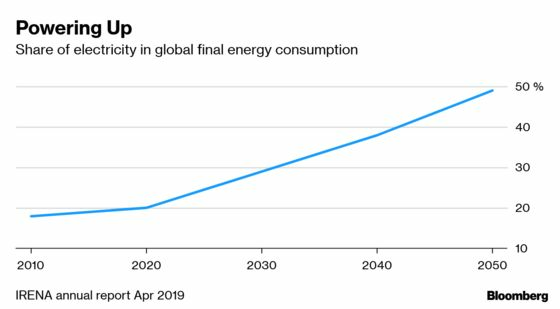 The global energy shift needs significant investments but they will more than pay off in curbing emissions and in health and environmental benefits, Irena’s new Director-General Francesco La Camera said by email. Green energy costs are falling rapidly, he said. The agency cut its estimate for the additional costs needed to meet Paris Accord goals by 40 percent in the last year, according to the report. Some 174 states and the European Union signed up to the Paris deal in 2015 pledging to keep global warming from rising above 2-degrees Celsius since the industrial revolution by 2050. The group is advocating greater use of electricity to cut the fossil-fuel emissions that are damaging the atmosphere. That would require putting 1 billion new electric cars on the road, increasing the use of power to provide heat and to make industrial gases. 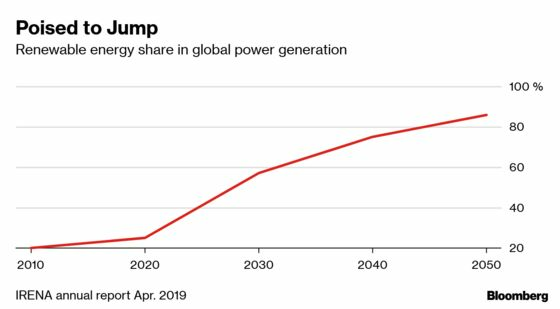 Electricity’s share of total energy consumption may grow from 20 percent share now to almost 50 percent in 2050, the report said.